Color cats of Siberian breed. 1. There are 2 main monochrome colors Siberian cat [Eng. solid]. Black: 100% black color: [eng. 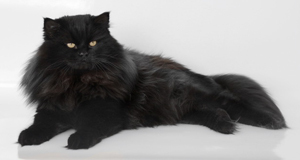 solid black] - the dominant pigment of the coat color of the cat is black. Color designation: n.
For each of the Solid colors, a clarified version is possible. Clarified black color is classified as Solid Blue - intense blue. Clarified red color has the classification of Solid Cream. Features of wool. Double undercoat and decent length - these are not the main features of the fur of Siberian cats. At the very bottom of the chest and in the region of the shoulder blades, the hairs are short and thick, that on the back and other parts of the body. In general, color has a direct effect on the texture of the wool, which can be very soft, and too coarse. In any case, in winter, the owner of the cat can safely let her go for a walk, because in such a "coat" she is unlikely to feel discomfort. Natural colors of Siberian cats. 3. Natural color allows the animal to hunt, and kitten to camouflage while staying in the wild. But only now the natural shade of wool to cats does not need anything, since they are now considered more decorative animals, therefore, the former skills in the "greenhouse" conditions of existence are not appropriate. It is noteworthy that any amount of white in color is appropriate and permissible. Only it should be taken into account that the white "Siberian", on the basis of generally accepted standards, should not have spots and inclusions of other colors.